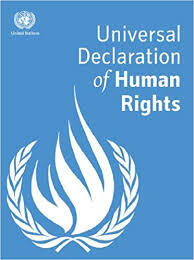 Research papers on international politics can be written on the Universal Declaration of Human Rights. Paper Masters has writers that are experts on human rights issues and will custom write on any nations human rights violations or policy. In 1948, the United Nations General Assembly adopted the Universal Declaration of Human Rights. Since that time, the United Nations has expanded human rights law to encompass many minority and other groups including women, children, disabled persons, and migrant workers. As given in the Declaration, these groups are protected against discriminatory practices. Regardless of societal norms, these laws extend certain rights to people that have established “universality, indivisibility, and interrelatedness with development and democracy”. In many of these cases the U.N. has been criticized for acting to late, and in some cases, for not acting at all. As given by these examples, the U.N. Declaration of Human Rights offers protection only when these rights are enforced by the member states of the United Nations. To some degree, the acceptance of international standards on rights is a revival of aspects of the natural law model, which presupposes the existence of inalienable rights common to all humanity. The more modern model, however, does not speak of rights as deriving from divine authority, but rather suggests that rights are fundamental to the fact that human existence demands equality. This is the essence of the human rights theory of rights. It does not, however, span a full gamut of rights that can be found in some societies. The United Kingdom, for example, has evolved a complex tradition of the nature, extent and application of rights. International declarations and treaties serve more to affirm that which already exists rather than to establish a new norm. In addition, in the modern concept, it is up to the state to secure and protect rights in a process that can be defined in terms of each society’s norms. The main caveat is to prevent these norms from transgressing or infringing on the rights agreed upon by humanity as a whole. All of the various theories regarding rights argue for the nature of rights in a different way and have different implications for analyzing their source, nature and application. Each theory was a product of the specific social and historical context in which it was developed, and which in turn had an influence on succeeding theories of rights. Because of this process that intertwines many cultural threads, an analytical approach that tends to parse specific elements of rights in order to reach an understanding has a great deal of difficulty identifying the precise elements of moral, legal and political rights. Georg Wilhelm Friedrich Hegel research papers examine the German philosopher known as one of the leading figures in the school of idealism. Locke's Theory of Knowledge - Locke’s theory of knowledge research papers detail his Essay on Human Understanding and depends heavily on the ideas that are formed in the mind. GI Bill of Rights - GI Bill of Rights research papers examine the Servicemen’s Readjustment Act of 1944 that provides a number of social benefits for soldiers returning from World War II. Seventeenth Century Developments - Seventeenth Century Developments Research Papers look at the different understandings of scientists during this time period and how it affected other centuries. Religion and Morality - Religion and Morality research papers discuss the frameworks of morality in religions. Equal Rights research papers go into the struggle for equality and human rights in the Western Civilization throughout the centuries. Women's Rights in United Nations - Women's Rights in United Nations Research Papers look at the goals set out by various United Nations decision making bodies. Gay Marriage in the Military - Gay Marriage in the Military Research Papers discuss the status of gay marriage in the military. Confederate Flag Controversy - Confederate Flag Controversy research papers discuss a major issue involving the confederate flag being taken out of the public after a man shot nine African Americans in a Church. Lesbian Culture - Lesbian Culture Research Papers discuss how the culture has expanded over the years as more women embrace their sexuality. Iranian Women - Iranian Women are inextricably linked to the fundamentals of Islamic religion which dictate that the word of God corresponds to the order of nature. Right to Vote - Right to Vote research papers discuss the ability of participating in the political process of a democracy. Reproduction: Rights and Justice - Reproduction: Rights and Justice Research Papers look at reproductive rights with its connotation of abortion as a choice. Mistreatment of Political Prisoners in Cuba - Mistreatment of Political Prisoners in Cuba Research Papers delve into Cuba's background on abusing political prisoners and the charges of human rights violations by people. Right To Die research paper examines euthanasia and human rights. The Cheap Labor Debate is an excellent topic for a business or MBA research paper. Four Theories of the Press - Four Theories of the Press research papers look at the main theories behind mass media's interpretation of what the purpose of the press is. Anti-War Sentiment in All Quiet on the Western Front - Anti-War Sentiment in All Quiet on the Western Front research papers examine Ramarque's book, reporting from the standpoint of an anti-war novel. Rights of Children Research Papers open up ideas of child rights. Exclusionary Rule Paper - Exclusionary Rule research papers often point out that it contrasts with the Fourteenth Amendment, in relation to the Constitution of the United States. Exclusionary Rule - Exclusionary Rule research papers are written on the fourth amendment of the United States Constitution. Paper Masters writes custom research papers on Universal Declaration of Human Rights and overview the United Nations adoption of the laws that protect basic human freedoms.